Over the last several weeks, there has been a lot of chatter about the supposed death of Air-Sea Battle. Here is an exclusive look—from the Pentagon's ASB Office itself—at what is actually happening. The authors represent the four U.S. military services in the Air-Sea Battle Office as well as the Joint Staff J-7 (Joint Force Development). The advancement and proliferation of disruptive technologies designed to counter power projection are undermining traditional U.S. military advantages. The worldwide growth of anti-access/area-denial (A2/AD) capabilities, the changing U.S. overseas defense posture, and the emergence of space and cyberspace as contested war-fighting domains enable potential adversaries, both state and nonstate, to counter qualitatively superior U.S. and allied forces. These formidable A2/AD capabilities can also cause U.S. and allied forces to operate with higher levels of risk and at greater distances from areas of interest. Given these realities, the Department of Defense recognized the need to explore and adapt concepts and capabilities to preserve U.S. power projection and freedom of action. In July 2009, Secretary of Defense Robert M. Gates issued guidance to address this challenge, including the development of a new operational concept called Air-Sea Battle (ASB). Since then, the services have used ASB as a framework for collaboration in new and thoughtful ways to address a critical and significant subset of the broader operational-access challenge as laid out in the chairman’s overarching JOAC. The JOAC describes operational access as the “ability to project military force into an operational area with sufficient freedom of action to accomplish the mission.” ASB’s particular contribution to the operational-access problem set has focused on the development of integrated forces capable of gaining and maintaining freedom of action in the global commons. The global commons are domains or areas that no one state controls but on which all rely. Freedom of action includes the ability to gain and maintain localized air superiority, maritime superiority, and space and cyberspace superiority and security, in addition to the ability to conduct cross-domain operations and operational maneuver. Recently, the four service chiefs reevaluated the “ASB Concept” and agreed that the concept should be revised into an authoritative joint concept, in support of and subordinate to the JOAC. Such a refinement should reflect additional conceptual elements that have been accepted over the years, such as an enhanced land-power contribution; changes to joint command and control; innovative approaches to land and sea basing; operating in areas of denied or degraded communications; and how various joint capabilities should be operationally applied to address the A2/AD problem set. Evolving the “ASB Concept” from its present multiservice arrangement into a fully integrated joint concept, under the oversight of the Joint Force Development Process, is a logical continuation of these ideas and development of capabilities to overcome A2/AD challenges. THE WORLD’S economy and global security have prospered because of freedom of navigation and open access to the global commons. For the last quarter century, U.S. and allied militaries have likewise relied upon near-unfettered access to the global commons to provide humanitarian relief, maintain stability during regional crises, and underwrite the deployment and sustainment of overseas forces in times of conflict. Today, potential state and nonstate adversaries possess advanced weapon systems that, when used as part of increasingly aggressive strategic postures, can challenge freedom of action and the power-projection capabilities of the United States, its allies and its partners. The A2/AD capabilities of potential adversaries threaten to make U.S. power projection increasingly risky while enabling aggressive actors to expand their coercive strength well beyond their borders. The range, scale and continuing proliferation of these access-restricting capabilities directly threaten U.S. and partner freedom of maneuver in the global commons, while also threatening the fundamental assurances necessary for global security and prosperity. The January 2012 Defense Strategic Guidance states, “The United States will continue to lead global efforts with capable allies and partners to assure access to and use of the global commons . . . by maintaining relevant and interoperable military capabilities.” One of the ten primary missions it identifies for U.S. forces is to “Project Power Despite Anti-Access/Area Denial Challenges.” Several joint operational concepts align under this strategic guidance. These concepts address the access challenge of projecting U.S. military power from the homeland into contested-entry operations at overseas locations in all five war-fighting domains. 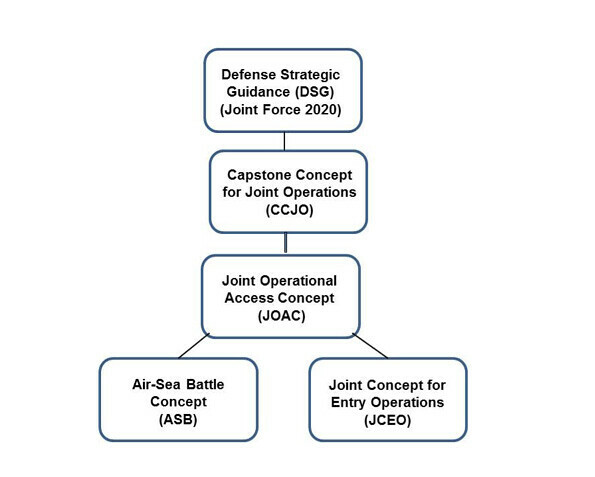 The chairman of the Joint Chiefs of Staff’s “Capstone Concept for Joint Operations: Joint Force 2020” (CCJO) proposes an approach called Globally Integrated Operations, where globally postured Joint Force elements combine quickly with each other and mission partners to fluidly integrate capabilities. The CCJO’s supporting concepts are a natural, integrated and deliberate evolution of U.S. power projection and are key components of the U.S. National Security Strategy. The JOAC describes in broad terms the chairman’s vision for how Joint Forces will operate in response to emerging A2/AD challenges. The “ASB Concept” supports the JOAC’s foundational precepts by providing an operational-level description of how the future Joint Force conducts operations to maintain access and freedom of action in the global commons. The “Joint Concept for Entry Operations” supports the JOAC and complements the “ASB Concept” by focusing on the integration of force capabilities across domains in order to secure freedom of maneuver on foreign territory within an operational area. SINCE SECRETARY of Defense Gates directed the development of the “ASB Concept” more than five years ago, the concept has been incorporated into more than two dozen service, combatant-command, joint and allied war games, experiments, studies and exercises. To date, tenets of the “ASB Concept” have been codified in three implementation master plans that capture and recommend force-development activities in key warfare areas to be adopted by the fleets and forces. These exploratory activities have revealed important insights. While many of the findings from these activities have validated ASB’s original central idea of the value of a more fully networked, integrated cross-domain force, other findings have revealed areas where ASB can be improved and expanded. Therefore, a revised, refined joint “ASB Concept” will provide an operational-level description of how the future Joint Force will conduct operations to gain and maintain access and freedom of action in the global commons, circa 2020–2025. Freedom of action in the global commons is a precursor to other operations, including flexible deterrent options, power projection and entry operations. An updated supporting joint concept will also describe an evolutionary approach to joint and allied operations across service, component and multinational lines in A2/AD environments. Building on existing JOAC precepts, the refined concept will incorporate the most useful ideas from the existing “ASB Concept” to include a force that is networked, fully integrated, and capable of cross-domain attack and defense in depth by U.S., allied and coalition forces in the global commons. Another key principle for the revised joint concept is that U.S. and allied forces must be able to operate with only localized domain control. Localized control consists of windows, corridors and defined areas of domain superiority where joint and allied forces can accomplish operational objectives and support other operations while preventing adversaries from disrupting friendly operations. This acknowledges that a joint or combined force may not be able to achieve either theater-wide domain superiority or an enduring and constant superiority, but that it can achieve operational objectives with control that is limited in time or space. Based on recent assessments, current doctrinal command-and-control methodologies will likely be inadequate to address A2/AD environments where beyond-line-of-sight communications and other connectivity between units can be disrupted or denied by an adversary. Therefore, evolutionary modifications to command-and-control structures and protocols are necessary in order to effectively command and control Joint Forces in a heavily disrupted electromagnetic-spectrum environment. Additionally, cross-domain expertise within component and lower-echelon operations centers must be leveraged to create cross-domain effects in support of the commanders’ intent and schemes of maneuver. The new joint concept will also advocate for a more comprehensive approach to land and sea basing, as well as a modified approach to logistics and sustainment. The ability to establish expeditionary land and sea bases in times of crisis and to sustain joint operational capabilities in contested areas is critical in the fight for access and operational maneuver. An idea that will also be further amplified in the new joint concept is an expanded role for land and amphibious forces in countering A2/AD threats to the global commons. Land and amphibious operations in these environments can consist of raids, demonstrations, shows of force, intelligence, surveillance and reconnaissance missions, and other types of relatively small-scale, impermanent operations by mobile and lower-signature expeditionary forces.